Do you support Credit and Debit card payments? Yes, Credit and Debit card payments are now supported without the need for a PayPal account. 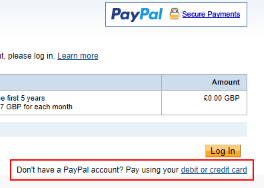 Just choose the pay Pay using your credit or debit card option when you go to the PayPal payment page. If this option isn't immediately available you may have to click the link shown in the screenshot. Of course you can still pay by using your PayPal account if you wish.